“Tosol-Sintez” Company is one of the leading producers of service fluids and car components in Russia. The Company has been presented in the market since 1993 and successfully carries out projects of producing and distributing car care products, brake fluids, antifreezes, windshield washers and engine oil, and also such high demanded products, as: spark plugs, wiper blades, brake pads and filters. All products are fully complies with international quality standards, as confirmed by test results and certificates of world famous research centers: ABIC TESTING LABORATORIES (USA), TUV (GMBH). Products manufactured by “Tosol-Sintez” have an allowance for the initial filling, and are delivered to the assembly lines of major car factories in Russia and CIS. In 2008 “Tosol-Sintez” Company was among the first suppliers who had successfully passed certification for compliance with ISO / TS 16949 (certificate IATF № 0077959) in TUV Cert (GmbH). The products are exported to 14 countries. They are delivered to customers within 24 hours. “Tosol-Sintez” company provides its products to car manufacturers from the initial filling on the assembly line to warranty and post-warranty service. 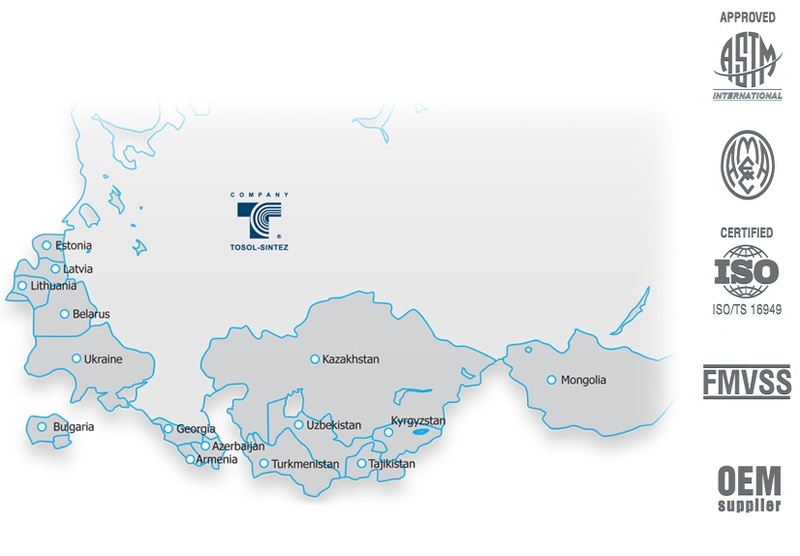 The company’s agencies are located in 83 Russian regions. Stores of specialized spare parts for cars.